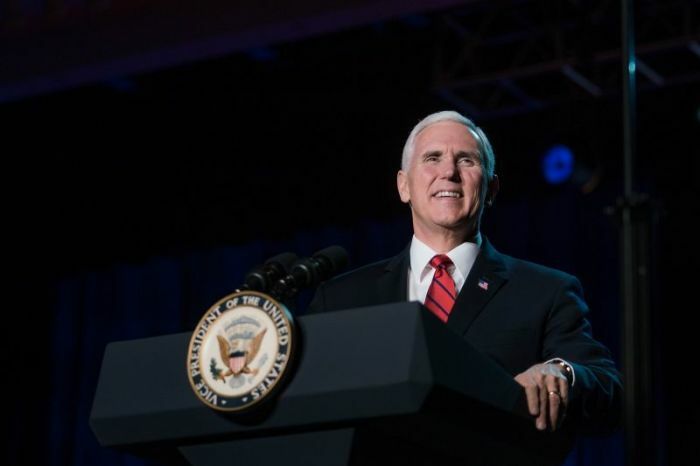 NASHVILLE — Vice President Mike Pence remembered the life of Billy Graham and shared how two of his children embraced Christianity thanks to the ministry of the late evangelist. During a speech delivered on Tuesday at the National Religious Broadcasters' 75th annual meeting in Nashville, Pence praised Graham, who died last week at age 99, as a "man of towering faith." "He was an example and his ministry for the Gospel and his matchless voice inspired our nation and the world," Pence said, adding that Graham's message was "consistent throughout his life." In 1999, Pence, his wife, and his three children attended one of Graham's crusades in Indianapolis, Indiana. "I'll never forget that night," he said. "I put my faith in Jesus Christ as a young man in college. But when our kids came along, Karen and I wanted our young family to hear Billy lead." The family watched as Graham gave a "stirring" presentation of the Gospel, and just as "Just as I Am" started playing, Pence's 8-year-old son and 6-year-old daughter headed to the floor of the arena along with thousands of others to give their lives to Christ. "My wife holding my youngest turned to me and said, 'go after them!'" Pence recalled. "My son looked up at me with those big brown eyes and said, 'Dad, I want to go down.' And so, we went. We prayed with a volunteer pastor." That prayer, Pence said, forever changed the lives of his children. Today, Pence's daughter is a writer in Los Angeles and his son is a lieutenant in the U.S. Army. Pence pointed out that Graham is the first person to lie in honor in the U.S. Capitol in over a decade. President Donald Trump and members of Congress paid their respects to Graham Wednesday morning at the Capitol. "Thank you, Billy Graham, and God bless you," Pence said. "The debt this country owes Billy Graham can only be repaid by relentless imitation of his example, which I know is what all of you will continue to do, because that's what NRB members have been doing with distinction for 75 years." Both Pence and Trump will attend Graham's funeral in Charlotte, North Carolina, this Friday. The NRB Convention is held annually and is attended by those in the field of Christian communications. This year's event kicked off Tuesday and concludes Friday. Pence stressed to Christian communicators that their ministry and message "are needed now more than ever before." "Every day, every hour, you speak strength to the heart of the American people. You shape our country. You water the roots of this nation," he said, noting that they have the power to "strengthen the character of this nation."